Please type your desired tags, e.g. Biochemistry and Chemical Biology, Hypoxia, Fibrosis, Political Economy, Psychological Sciences, Critical Infrastructure, Emerging Media Art, Electrical Engineering, ChIP-seq, Enhancer Mechanisms, Financial & Managerial Economics, Dietetics, Gender Equity, Public Adminstration, Nineteenth and twentieth century feminist, and etc. Dr. Li Zhang has made major contributions to understanding the molecular mechanisms underlying heme signaling in eukaryotic cells. Heme is central to oxygen sensing and utilization in virtually all living organisms. In mammals, heme is critical for erythroid, hepatic, and neuronal functions. Oxygen sensing is directly related to many fundamental physiological and pathological processes, including angiogenesis, tumor development, and ischemia. Investigating the molecular mechanism of oxygen sensing and heme signaling is the main objective of Dr. Zhang2s lab. Furthermore, Dr. Zhang's lab is interested in investigating the molecular mechanisms by which common neurotoxicants act in neural cells, because studies of neurotoxicants should facilitate the understanding of many neural functions and neurological diseases. Dr. Zhang2s lab combines approaches of molecular and cellular biology with genomics and computational approaches to elucidate the global molecular mechanisms underlying cellular responses to environmental stressors, including hypoxia and environmental toxicants. 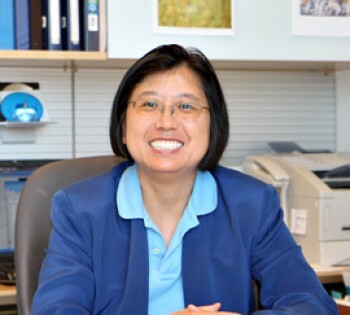 Dr. Zhang recently joined the Department of Molecular & Cell Biology as Professor and Head, coming from Columbia University, where she was professor of Environmental Health Sciences. Dr. Zhang also holds the Cecil H. and Ida Green Distinguished Chair in Systems Biology Science. Heme is the iron-containing molecule in hemoglobin that gives blood its deep red hue and binds to oxygen, allowing for its distribution throughout the body. “The field has progressed significantly throughout the last decade,” Zhang said. “It’s something I’ve studied for years now, and I thought it was the right time to work on this project.” Throughout her more than 15-year career, Zhang has made significant contributions to the field of molecular biology—particularly in the study of heme signaling and its role in tumor development, shortage of blood supply to tissues in the body and defective heme synthesis. Recent research has shown that cancer cells have a much different – and more complex – metabolism than normal cells. Now, scientists at The University of Texas at Dallas have found that exploiting these differences might provide a new strategy to combat lung cancer. In an article published online May 21 in the journal PLOS ONE, UT Dallas researchers compared the metabolic characteristics of “non-small-cell” lung cancer cells with normal lung cells taken from the same patient. The University of Texas at Dallas has appointed a noted Columbia University professor of environmental health sciences to lead the Department of Molecular & Cell Biology. Dr. Li Zhang will also hold the Cecil H. and Ida Green Distinguished Chair in Systems Biology Science. She starts work Nov. 1. Zhang will succeed Dr. Donald Gray, who has headed the Department of Molecular & Cell Biology for three years and previously from 1985 to1995. Learning from graph-structured data: new algorithms for modeling physical interactions in cellular networks.